Background: Schiff bases have a broad spectrum of biological activities including antiviral, antibacterial, antifungal, antimalarial, anti-inflammatory antiproliferative and antipyretic properties. 1,3,4-oxadiazoles have been reported to show spectrum of biological activities including such as antiviral, fungicidal, antineoplastic, antimicrobial anti-HIV, antitubercular, antihypoglycemic, antimalarial, antioxidant, analgesic, anti-inflammatory, anticonvulsant, anticancer and inhibition of tyrosinase, antitumor and antiproliferative. Morpholine is known as a valuable structure for the synthesis of more efficacious antimicrobial agents. 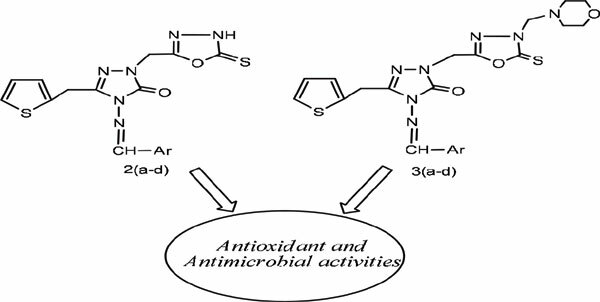 Therefore, the study presents the synthesis, antimicrobial and antioxidant evaluation of a series of 1,3,4 substituted oxadiazole derivatives. Methods: Synthesis of compounds 2(a-d): 0.01 mol 4-amino-1-((5-mecapto-1,3,4-oxadiazol-2-yl) methyl)-3-(thiophen-2-ylmethyl)-1H-1,2,4-triazol-5(4H)-one (1) and 0.01 mol aromatic aldehydes were heated in oil bath without solvent for 2-3 h at 160-180 0C. Then on completion of the reaction, followed by TLC examination, allowed to cool to room temperature. The separated solid was filtered and crystallized from a mixture of DMSO and water (1:2). Synthesis of compounds 3(a-d). A mixture of formaldehyde (0.02 mol) and morpholine (0.02 mol) in DMF was added to solution of compound 2 (0.01 mol) in DMF. The resulting mixture was stirred overnight at room temperature. The precipitated solids were filtered, washed with water and recrystallized from DMF/water. Determination of Antioxidant Activity: The FRAP method was used for the determination of total antioxidant capacity, based on the reduction of yellow Fe3+ -TPTZ complex to the blue Fe2+ -TPTZ complex by electron donating substance under acidic condition. Radical scavenging activity of compounds against 2,2-diphenyl-1-picrylhydrazyl (DPPH) radical was spectrophometrically at 517 nm. The assay is based on the color change of the DPPH solution from purple to yellow as the radical is deactivated by the antioxidants. Briefly, the stock solutions of each extract were prepared in DMSO and if necessary sequential dilutions were made. Results: All of the compounds synthesized in this study, except 3c, showed antioxidant activity in the free-radical scavenging (DPPH) and ferric reducing (FRAP) tests at different grades (Figs. 1 and 2). The antioxidant activities of the compounds were differentially influenced in the DPPH and FRAP tests from the substituents of Schiff and Mannich bases. It has been determined that the effects of the substituent type of the thiophene ring on the activity were different for Schiff bases (2ad) and Mannich bases (3a-d). High-to-low activity sequencing was H-CN-NO2-Br (in DPPH assay) and NO2-H-CN-Br (FRAP assay) on schiff bases while Br- H- NO2-CN (in DPPH assay) and H-Br- NO2-CN (in FRAP assay) on mannich bases. Similarly, in DPPH and FRAP assay, the Schiff bases (2a-d) were more active when compared with the Mannich bases (3a-d). Conclusion: In the work, new eight Schiff bases bearing thiophene, 1,2,4-triazolone, 1,3,4-oxadiazole, morpholine moieties were synthesized. The new compounds, well characterized by elemental analyses, IR, 1H NMR and 13C NMR were tested for their antioxidant and antimicrobial activities. In DPPH and FRAP assay, the compounds 2(a-d) with Schiff base were more active when compared with the compounds 3(a-d) containing Schiff base and morpholine substituent and 2(a-c) had a respectable antioxidant potential. The lowest MIC value, i.e. the highest antimicrobial activity, were observed in compound 2a against Bacillus cereus RSKK 709 with a MIC value of 31.25 µg/mL. Schiff base, mannich base, morpholine, antimicrobial, antioxidant activities, MIC.